As we know in IT era everything is going to digitalize so using traditional system of accounts (especially non-computerized system) it is almost impossible to obtain the aforementioned information with high accuracy and within desired time. but being a responsible company, who is serving brick kiln industry for last 14 years, we consider it our primary responsibility to guide and advise (on how to buy a good software for brick kiln) all brick kiln owners who still are not using computer as their primary record keeping tool or are using computer to maintain record. This is a Business Oriented Software manage account upto balance sheet as well as other business process. User friendly and easy flow, a layman can understand in short time after basic training. Our team member has same business so can easily understand the client requirement and provide solution accordingly. This software developed under guidance of brick kiln owners, CA and other concerned professionals. Easy to trace the leakage during audit process due to tremendous report. Effective training and implementation from experts. 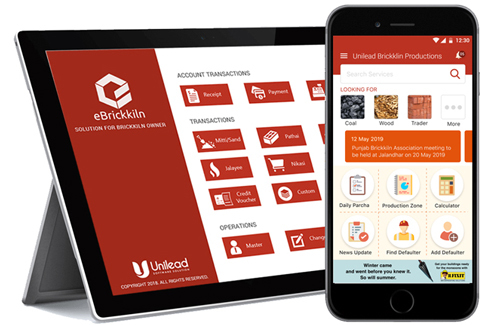 eBrickkiln Solution is unique electronic way to have the every minor detail of the business on tips. eBrickkiln Solution is the outcome of the year's hard-work of a team of specialized software engineers. Its quick access features can save your time. As in eBrickkiln we have given many important and frequent shortcuts on the main screen. On company selection, there is again a security check so that no unauthorized person can access data without your permission. Admin can provide the right to user as per their job profile. If any requirement provided by new client will consider on priority basis and after deep analysis will update the same in new version.